The Peddle Master was invented and developed for the physically challenged driver, by a physically challenged driver, to offer them an alternate choice to current hand controls on the market today. Because of the high price and permanent installation of the hand controls on the market today, we felt there was a need for a more portable hand control solution. The Peddle Master has been evaluated and tested by the Louisiana Tech University, and was determined to be the most user friendly of any hand control on the market. Also, it was evaluated and tested by the UVA Auto Safety Laboratory in Virginia for durability and to be used in the automobile industry. This actually means that it is SAE tested and approved. The Peddle Master Hand Control is totally portable and can be installed and removed in a matter of seconds. The Peddle Master can be used in over 90 percent of the vehicles manufactured in the world today. We suggest the automobile being used have an automatic transmission and power brakes. One of the benefits of The Peddle Master is that it can be installed and removed by the driver while in the driver's seat. No tools are needed. It also gives the physically challenged driver the option of test driving any car he or she wishes to drive before purchasing. Only 20 to 30 percent of the world's airports offer handicap vehicles for rent. The lightweight (2 lbs.) and portable Peddle Master can be taken with you in your suit case, so physically challenged drivers have the option of renting any car that fits his or her needs. Please Note: The Peddle Master Portable Vehicle Hand Controls DO NOT come with a strap to brace the hand controls to the steering column. Stays in Place. Convenient. Easy to Use. Comfortable. Good Value. High Quality. Can Withstand Use. Daily Use. Short Trips. Long Trips. Travel. Lost the use of both legs. The only problem I had was I purchased the product for 1 to 3 day air shipping and it still took eight days to get to my house. A total ripoff of the cost of shipping. I think I deserve the shipping costs refunded to me, as I probably will not order from your company again due to this. Stays in Place. Convenient. Easy to Use. Can Withstand Use. Comfortable. Good Value. High Quality. Daily Use. Short Trips. Travel. Long Trips. This product has allowed me to get back in my car and be mobile and independent again. So far, I'm very pleased! Also, the portability of this product doesn't require any permanent modifications which is great when others need to drive the vehicle. Convenient. Comfortable. Stays in Place. Easy to Use. I like it and it makes it so I can drive, it takes a little geting use too. Stays in Place. Convenient. Easy to Use. Can Withstand Use. Comfortable. What an awesome product ... I have MS and the feet just do not work. Went on line to look into hand controls and came across Peddle Master. They looked too good to be true but thought I had nothing to lose since they were returnable so I ordered them. Hubby drove me to a huge parking lot and I got in the driver's seat and anxiously pushed down on the gas... wow ...this is simple ! I drove around the lot - stopping-starting-backing up - Piece of Cake ...I headed out of the parking lot and into traffic with all the confidence in the world ... Absolute terrific product. 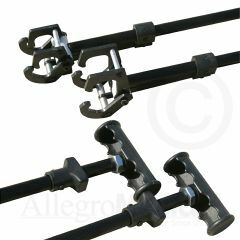 Pricing varies but Allegro offered at best price and I got them in short order ... I highly recommend this wonderful product and Allegro Medical. Are there any DMV obligations/special license to use this? how would I steer and brake and use gas simultaneously. You can't, but you don't need to. Ever. Even in competitive motorsports, there's rarely ever a need to brake AND gas simultaneously. Ok I see two clamps one for each peddle. Who is steering the car while your other two hand are holding both of these devices? Can I get parts? I have had this pair for a few years and LOVE them.. But I broke the "claw" pieces and need to replace them.. I was concerned when i read they dont stay in place.Please tell me, is there a Guarantee with this product? Asked on Jan 25, 2013 6:11:46 PM by Maddie from Salisbury Ct. The one I hooked onto the gas pedal came off, I reset it, and then after driving a while, could not get it back off, had to pry it off! I have an above the knee right leg amputation. I am seeking a certified place where I can gt the accelerator pedal to change over to the steering wheel. Any suggestions? Stayed in place until the gas peddle your attachment broke.I have used it one month. Can I add the peedles to any car or is only for vans.. Asked on Jan 5, 2012 7:33:03 AM by Ahhmed from MN, Mpls U.S. I had both of my legs amputated on 8/2010, and now I am in the process of getting hand controls for my van. My question is that can you put the controls yourself? On the other hand I heard that you have to let someone that is qualified to do it. And do you have to go to the DMV to let them inspect it? So PLEASE I need an answer ASAP, because I am getting cabin fever, if you know what I mean. Thank you very much!!! Asked on Sep 5, 2011 10:19:21 AM by SPEEDY from Prescott Valley, Az. I am disabled and use hand controls on Both of my vehicles. Answered on Sep 16, 2013 3:02:24 PM by freda1 from pevely mo. My injury level is L-1, and I am in the process of getting a car, and am looking for hand controls for it so I will be able to drive. Is this type what I'm looking for or would something else be beneficial? My right leg is amputated below the knee, but the tendons have tightened so much I cannot use a prosthesis. I would like to drive because my wife has limited mobility also. Is this what I need to get back behind the wheel? I'M A DOUBLE AMPUTEE BELOW KNEE AND I NEED HAND CONTROLS WOULD THESE BE THE ONES I SHOULD BUY? I am a c-6 spinal cord injury. I can only drive with my hands... I've tried many hand controls, the best are permanent ones installed by professional. The peddle masters are soooooo terrible for SOO many reasons. I have used phc-3 hand controls that work very well .